Shochu is a Japanese traditional hard liquor, distilled spirits made from grains and vegetables. The most common base ingredients are sweet potato, barley, rice, buckwheat and sugar cane. How is Shochu different from Nihonshu (Sake) ? “Sake” is a general term for alcohol beverages in Japan. 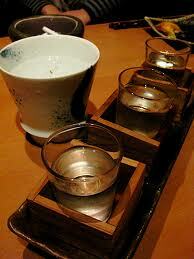 However Nihonshu (Seishu) is commonly referred as “Sake” in America. Nihonshu and Shochu are both traditional Japanese alcoholic beverages, but there are some important differences between them as follows. Shochu is distilled liquor, similar to brandy and vodka. However Nihonshu is categorized as fermented liquor putting it in the same category as wine. Grapes are both fermented to make wine and distilled to make brandy. In Japan, rice can be fermented to make Nihonshu, or distilled to make rice Shochu. Before Nihonshu became famous in west, it sometimes used to be referred to as “rice wine” in acknowledgement of the resemblances between wine making and Nihonshu making.